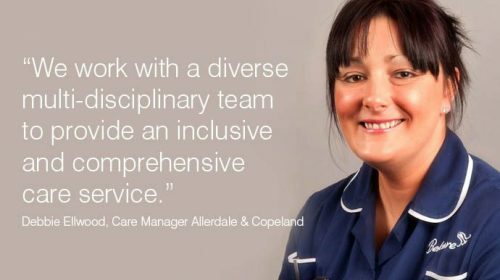 As part of Bellcare’s commitment to provide research based caring excellence in our local Cumbrian communities, we have recognised the need for enlightened support and information regarding Dementia for our Service User’s, their carers’ and families and all our employees. There is a need to work with current initiatives, to use the information gathered to push forward with those aspects of Dementia Care which are relevant to our discipline, domiciliary care. The National Dementia Strategy ‘Improving Life with Dementia’ focuses on the outcomes that are important to people with dementia, their families and their carers’. It aims to empower them to sustain their health and wellbeing and to lead the lives they chose, as far as possible, through the course of the illness. The strategy recognises that people with dementia and their families and their carers’ are partners in the4 process of clarifying needs and solutions and, in some instances, meeting the needs of others. Cumbria’s Dementia Strategy sets out the agenda and framework for a programme of improvement as defined by the National Dementia Strategy and refined by extensive local discussion over the last 2 years. It is a working document, which has been agreed as a basis for an integrated and coordinated approach. The implementation process is action orientated and aims to stimulate the development of plans for improvement. These plans will identify who will take the lead, when improvements can be expected, and how they will be resourced and financed. The process and framework also provides the opportunity for a wide range of organisations, groups and individuals to engage with and contribute to the task of implementation. A Dementia Implementation Group has been established with a membership that consists of a small group of senior staff from health, social care a key third sector agencies, which over the next three years will drive and coordinate a programme of improvement. This group will report on progress to Cumbria’s Health and Wellbeing Board. In order to ensure that people with dementia, their families and carers’ can contribute to the process the Alzheimer’s Society in Cumbria have established a programme of local forum meetings. These will act as a focus and channel for their views, comments and suggestions to be fed into the task groups.